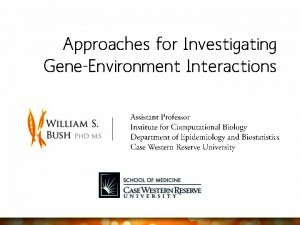 At the 2015 Pacific Symposium on Biocomputing, Dr. Will Bush gave a tutorial on gene-environment interactions in a session titled "Characterizing the Importance of Environmental Exposures, Interactions between the Environment and Genetic Architecture, and Genetic Interactions: New Methods for Understanding the Etiology of Complex Traits and Disease". Slides can be downloaded to the left. Posted in Slides, Tutorial, Will Bush.